Examining a ball gall on S. altissima. Abe, a teacher and researcher at Bucknell University from 1973 until 2012 and a Research Associate of Archbold Biological Station from 1976 to the present, held Bucknell’s endowed David Burpee Chair in Plant Genetics from 1983 until his retirement in 2012. He has published over 160 scientific articles as well as 2 books (see Publications link) and his lab hosted 21 Post-Doctoral Fellows (see Post-Doctoral Fellow link) between 1981-2011. His research contributions were recognized in 2008 when he was named a Fellow of the American Society for the Advancement of Science (see AAAS Fellow link) and in 2014 when he received the Science and Conservation Awareness Award from Archbold Biological Station. 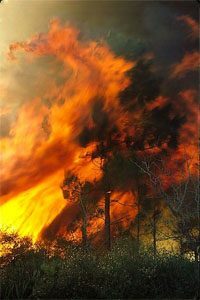 The Ecological Society of America’s Board of Professional Certification named him a Senior Ecologist in 2001. 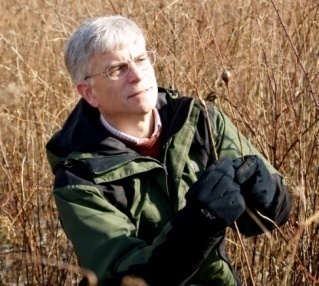 While his research interests are broad, many of his research projects focus on ecological and evolutionary interactions among host plants (e.g., goldenrods and oaks), their herbivores (e.g., gall inducers), and the natural enemies of herbivores; Florida Scrub vegetation dynamics; demography of dwarf palms (palmettos); and the role of fire in Florida Scrub. In addition to continuing his research in retirement, he remains enthusiastic about land conservation, ecology, antique farm machinery, and craft beers. Abe’s teaching was recognized with two awards from Bucknell University, the Lindback Award for Distinguished Teaching in 1975 and The Class of 1956 Lectureship in 1982 and he was nominated for Baylor University’s Robert Foster Cherry Award in 2007. His commitment to conservation was recognized in 1984 with National Audubon Society’s William Dutcher Award for Outstanding Service to the Audubon Cause at the Regional Level (Mid-Atlantic Region) and in 2002 by a Lifetime Achievement Award from the Merrill Linn Land and Waterways Conservancy. He was honored to present Pettingill Lectures at his alma mater University of Michigan’s Biological Station in 2002 and Eminent Ecologist Lectures at Michigan State University’s Kellogg Biological Station in 2009. Passionate about energy-efficient building design, abe designed his passive-solar, wood and geothermal-heated home and he designed and built a passive-solar, geothermal-heated office and shop building in 2011 that is adjacent to his home on Shamokin Mountain near Lewisburg, Pennsylvania. He and his wife Chris placed a conservation easement on their mountain-top forest land in 2013 to protect their forest land in perpetuity. He regularly volunteers his services to the Linn Conservancy. 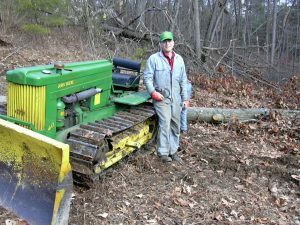 Abe owns and maintains two John Deere antique tractors, a 1954 model 40c gas crawler tractor and a 1975 model 2630 diesel orchard tractor, and uses them to maintain the Conservancy’s Shamokin Mountain Trail, which crosses their property, extract firewood from their forest, and plow snow. Abe enjoys travelling and has participated in expeditions to the Andes Mountains, Amazon basin, as well as 3 trips to Ecuador’s Galapagos Islands (1979, 1990, 2008), Peru (including Machu Picchu), and Brazil. He has rafted or canoed white-water rivers (Tatshenshini, Alsek, Nahanni, and Wind Rivers) in the Yukon, Northwest Territories, British Columbia, Alaska, as well as the Selway River in Idaho, and 2 trips on the Colorado River in the Grand Canyon of Arizona. 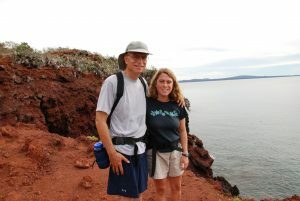 He co-led the 2008 Bucknell alumni Galapagos Islands trip with his daughter Jill. Abe crossed Russia via the Trans-Siberian Railroad in 1993 spending time at the Russian Academy of Science in Krasnojarsk, Siberia and toured natural areas in Botswana, Namibia, Zimbabwe, South Africa, and New Zealand, in addition to England, Scotland, Hungary, and Switzerland. He and his wife frequently participate in Road Scholar travel programs.